DCI/Palestine “is a national section of the international non-government child rights organisation and movement (dedicated) to promoting and protecting the rights of Palestinian children,” according tointernational law principles. On December 28, it submitted a complaint [PDF] to several UN authorities titled, “The use of solitary confinement on Palestinian children held in Israeli detention.” It’s specifically for five children held at Al Jalame and Petah Tikva interrogation centers in Israel. Though no universally agreed on definition exists, the Istanbul Statement on the Use and Effects of Solitary Confinement defines it as physically isolating prisoners in cells for 22 to 24 hours daily. Human contact is minimized, including quantitative and qualitative stimuli. for many, a totally dysfunctional state and inability ever to live normally outside of confinement. As a result, UN Special Rapporteur on Torture Juan Mendez called for totally banning it for children. Calling it “torture or cruel, inhuman or degrading treatment or punishment,” he stopped short of demanding its prohibition against everyone. Israel frequently isolates adults and children, notably Palestinians. Facilities most commonly used include Al Mascobiyya interrogation center in Jerusalem, Petah Tikva near Tel Aviv, and Al Jalame near Haifa. Israel’s Prison Service (IPS), Israel Security Agency (ISA), and Israeli police administer these facilities. From February 2008 through November 2011, DCI/Palestine documented 34 child abuse cases. They endured “cruel, inhuman or degrading treatment or punishment, and in some cases, torture, in violation of the” Torture Convention, the Convention on the Rights of the Child, the Covenant on Civil and Political Rights, and Fourth Geneva. Israel spurns all international laws with impunity, including those pertaining to war, occupation, and fundamental humanitarian and human rights. At Al Jalame, children are held in 2 x 3 meter cells. In 2009, one child endured 65 days of punishment. All of them sleep on concrete beds, or on the floor on thin, dirty, foul-smelling mattresses. Meals pass through door flaps, depriving them of human contact. Al Jalame’s “Cell No. 36 (like all isolation ones) has “sharp protrusions preventing the children from leaning against them for support.” It’s windowless with artificial light only coming from dim internal lighting kept on 24 hours a day. Harsh treatment, including prolonged isolation, painful shackling, physical violence and torture are used to extract confessions. Children at Al Jalame and other interrogation facilities are generally denied access to lawyers and family visits in violation of Fourth Geneva and other international laws. DCI/Palestine submitted complaints for five Palestinian children. They were identified only by initials, age, gender, ID No., and place of origin. On October 15, 2011, Israeli soldiers arrested OA at 2AM from home. He was blindfolded, painfully shackled, placed in a military vehicle, taken to Huwwara interrogation center in Palestine, forced to sit on the ground until dawn, and refused permission to use a toilet. “I was in a very bad psychological state, so I decided to confess. I confessed to throwing Molotov cocktails and stones at army jeeps,” even though he was innocent. Isolated for 16 days, he’s now at Megiddo prison in Israel. Others DCI/Palestine represented told similar stories. They were falsely charged, arrested, interrogated, isolated and harshly treated overall. Israel treats children like adults, some young as 10. 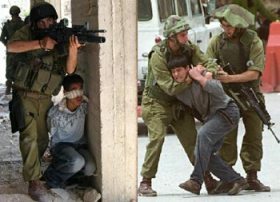 In fact, Palestinian children are routinely arrested at checkpoints, on streets, going to or coming from school, tending olive groves, at play, and (most commonly) at home in the middle of the night. Usually it’s from midnight to 4AM. Family members are threatened not to intervene. If they try, they’re assaulted and forced onto streets in their nightclothes, regardless of weather, and given no explanation. Typically, arrests are lawless and violent. Homes are broken into unannounced. Property is damaged or stolen. Children are blindfolded, shackled, often beaten, then thrust into jeeps, sometimes face down. In interrogation centers, inhumane treatment continues, including beatings, verbal abuse and intimidation. Most often, lawyers aren’t present until questioning ends with a signed Hebrew confession children can’t read or understand. Once gotten, they’re used to convict even though torture extracted evidence is inadmissible under international law. Often parents and siblings are also arrested, beaten, detained, and their homes sometimes demolished. Under Military Order 132, children aged 12 – 13 receive maximum six month sentences. Those aged 14 – 15 usually face 12 months, but can receive up to five years. More serious offenders face no limits. Military Order 378 permits up to 20 years for stone-throwing (the most common offense charged). Moreover, children 16 or older are considered adults and treated no differently. Under international law, adulthood begins at age 18. Under military occupation, Israel’s system is rigged to convict and brutalize before and after incarceration, despite Fourth Geneva’s Article 147 requiring fair trials, and holding those responsible for denying them criminally liable. International law also forbids torture, other abuse and inhumane treatment at all times, under all conditions with no allowed exceptions. Israel ignores all international laws. It does what it please, including against children young as 10 no matter their innocence. DCI/Palestine and other human rights organizations demand these crimes against humanity end and those responsible held accountable. So far it hasn’t happened. Stephen Lendman lives in Chicago and can be reached at [email protected]. Also visit his blog site at sjlendman.blogspot.com and listen to cutting-edge discussions with distinguished guests on the Progressive Radio News Hour on the Progressive Radio Network Thursdays at 10AM US Central time and Saturdays and Sundays at noon.